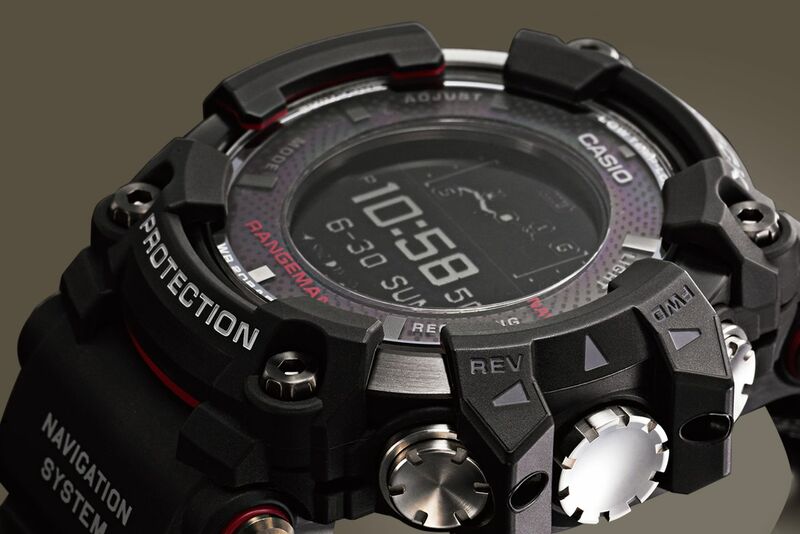 Casio G-SHOCK’s first watch with built in solar-assisted GPS goes on sale in the United States this week. The Rangeman GPRB1000, now available in black or olive green, is being billed as the ultimate timepiece for survival situations. The watch has altimeter, barometer, compass and thermometer sensors, and is resistant to water to 200m, mud and freezing weather. The watch communicates with GPS satellites to display the current location on a route or bearing to a destination, in real-time. It also saves track and point data(including longitude/latitude, altitude, and temperature in memory. The timepiece also incorporates a new dual task display that can show current time, date and world time split with the user’s choice of navigation path, barometric graph or sunrise/sunset data. Using Bluetooth, the watch pairs with a smartphone to connect with the G-SHOCK Connected app, allowing the owner to create routes or manage log data in the app. Tracks and point data saved in memory are displayed on a 3D map or as a timeline. The watch also receives data from time servers to keep accurate time anywhere in the world. Each timepiece boasts a carbon fibre insert band, stainless steel black IP buckle and bezel, sapphire glass crystal, high-contrast MIP (Memory In Pixel) display and super LED backlight, as well as 3,300 almanac points for accurate tide and moon data. In another first for G-SHOCK, the watch has a 2mm thick, shock-resistant, ceramic case back, which enables wireless charging and high sensitivity GPS reception. The uncompromising watch is on the large side at 57.7mm across. It is on sale now for $800 at G-Shock retailers including select Macy’s, jewelers, www.gshock.com, and the G-Shock Soho Store in New York.